Watch: Texas man spots a ‘few’ snakes under his house; rescuers pull out 45 rattlesnakes! Sharing details about the back story, the company on their page wrote the owner discovered a "few" snakes while attempting to fix a TV or cable issue under the home. Yes, the footage, which is now going viral over one million views on Facebook alone, shows a den of rattlesnakes in all sizes. while some were really young and still babies, others were not so small and weren’t happy when the rescuers tried to bring them out from their cosy shelter. Hissing and making the loud rattling noise, every time they tried to bring one out from under the building. The video was shot near Abilene, Texas, on March 13, and the reptiles were rescued by the Big Country Snake Removal company. Sharing details about the back story, the company on its page wrote the owner discovered a “few” snakes while attempting to fix a TV or cable issue under the home. It also warned that the house was well kept and cleaned, and it doesn’t mean snakes will not seek shelter in tidier places. “Rattlesnakes don’t care how nice your house is or what kind car you drive- they care simply about survival,” the page warned citizens. And while the number of snakes seem pretty high, it’s nothing extraordinary for Hawkins who has been doing this for last 20 year. Talking to The Washington Post, he said, “It was just another day, honestly,” adding that the most he has ever removed from a person’s home was 88 snakes! 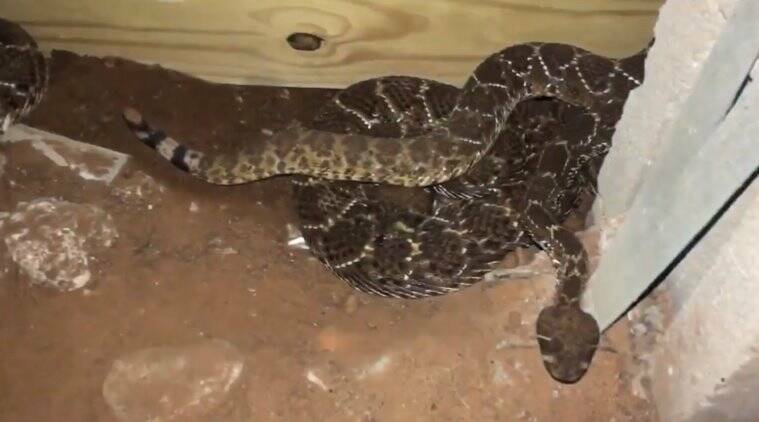 Watch: Texas man spots a 'few' snakes under his house; rescuers pull out 45 rattlesnakes!